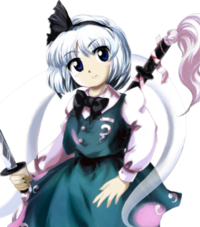 Youmu Konpaku (魂魄　妖夢, Konpaku Youmu) is a half-human half-phantom who lives at Hakugyokurou in the Netherworld as a gardener and fencing instructor, who also serves for Yuyuko Saigyouji. 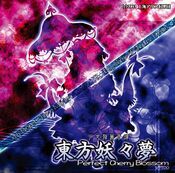 She first appeared as the Stage 5 boss of Perfect Cherry Blossom, the seventh installment of the Touhou Project, and has since become a recurring playable character. Youmu, as illustrated in GoM. In Perfect Cherry Blossom, she gathered all of Gensokyo's spring at Yuyuko's instruction, which was the reason Gensokyo's winter did not end. 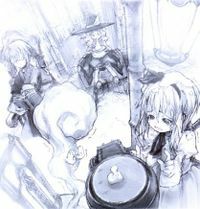 In Bohemian Archive in Japanese Red and Chapter 13 of Curiosities of Lotus Asia, she took on the responsibility for collecting and returning the phantoms that wandered around Gensokyo as a result of the boundary of the Netherworld being thinned. She belongs to the subspecies of phantoms called the "half-human half-phantoms" (半人半霊, "hannin hanrei" or "hanjin hanrei"). Half-human half-phantoms are the mixed-race of phantoms and humans (幽霊と人間のハーフ), which have a largish phantom accompanying them and a relativity long life span compared to humans. The phantom that always follows them is called the "half-phantom" (半霊、半幽霊, hanrei, hanyuurei), and they are the other half of their body. In Perfect Memento in Strict Sense, it was supposed that Youmu's human half manipulates the phantom half consciously. Youmu's human half has a lower body temperature compared to normal humans, and her phantom half's body temperature is not so cold compared to normal phantoms. In the Imperishable Night manual, it was written, "she has two kinds of body: human and phantom," showing Youmu to be "human" and the phantom to be "phantom." Half-human half-phantoms are long-lived, but in Seasonal Dream Vision, since it has still not been 60 years since the time she was born, in Phantasmagoria of Flower View, she was not very knowledgeable about the "flower incident that occurs once every 60 years." As she has a straightforward diligent personality, she is often manipulated by those around her (especially Yuyuko). For this reason, she often fails at her task, but that does not mean that she has no real power, and she particularly excels at instantaneous force and concentration power. In Immaterial and Missing Power, as literally stated by the shishou, "truth-slashing is something which you know," so she often performs tsujigiri-like moves, but Suika Ibuki pointed out that she does not think that Youmu understood her shishou's teachings. She has strong sensitivity, and in the good ending of Imperishable Night, her human half was unable to resist the insanity-inducing effects of the true Moon, causing her to become "half-insane". Ironically enough, considering her species, she is afraid of ghost stories, dares, and darkness, but she is calm around phantoms since she is half phantom herself. In Imperishable Night's Extra. After defeating Fujiwara no Mokou, Yuyuko pretends there is a ghost under a tree, earning a terrified shriek from Youmu. Much further on in Ten Desires, as a result of being mistaken as a hermit, she temporarily mistook herself as being a hermit. Due to artworks and her sprite in the fighting spin-offs, Youmu may be ambidextrous. 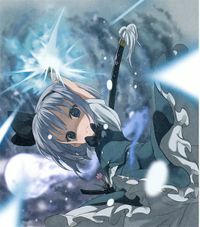 Youmu is, as a gardener attached to the Saigyouji family and the bodyguard of Yuyuko Saigyouji, a swordsperson of a two-sword school of fencing. 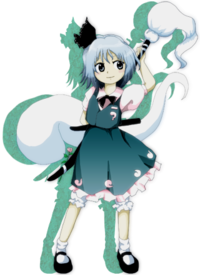 According to the Saigyouji family, Youmu is the second generation to take her position, the former generation being Youki Konpaku. Youki was Youmu's fencing shishou. 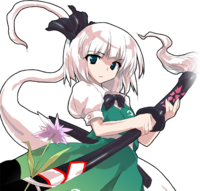 Youmu is also Yuyuko's sword instructor, but she is fundamentally treated as a gardener. The katana, carried from her left shoulder to her waist on the right side, is Roukanken (楼観剣, lit. "high-building sword"). It has been claimed to have been forged by youkai, and has the power to kill ten phantoms in one slice. The shorter sword on her left waist is a wakizashi named Hakurouken (白楼剣, lit. "plain-building sword"), which seems to be the heirloom of the Konpaku family, and can slice through people's confusion. Her full name is Youmu Konpaku (魂魄　妖夢). The characters for Konpaku (魂魄) means "soul", and Youmu (妖夢) probably means "ghostly dream" in the context regarding her characteristic. Bear in mind that the "n" is an "m" sound; this is because it flows more smoothly in Japanese when it's before a "p" sound. Although both kon (魂) and paku (魄) means "soul", their elements are different. Kon stands for a "mental" soul, which is separated from a body as soon as human dies and ascends to Heaven; paku is a "physical" soul, which remains in the body a few days and goes back to the Earth. In this case, kon is Youmu's ghostly half, and paku is the human half. The entire Konpaku family is comprised of half-phantom half-humans. The kanji that makes up Youmu (妖夢) are also part of the kanji for Perfect Cherry Blossom (東方妖々夢, Touhou youyoumu). 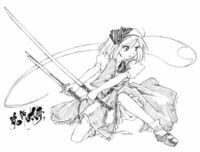 In Phantasmagoria of Flower View, Youmu's name is written in romaji, with her surname first, during pre-battle conversation with her, even though every other character in the game with a Japanese name has their name romanized western-style, with their first names first. This is one of several typographical inconsistencies in the game (another being the inconsistent spelling of Aya Shameimaru's name). In Perfect Cherry Blossom, Youmu has short silver hair worn in a bob cut, and bright red eyes. She wears a dark green and white dress with several ghost insignias along the edges and a ghost insignia as well on her breast pocket, and a black ribbon tied off-center in her hair. She carries the Roukanken; a long katana with a cherry blossom insignia and a flower attached to it, and the Hakurouken; a wakizashi (Short Japanese sword). Her ghostly half is a formless white phantom as large as her human self. In every later game, Youmu has slight design alterations such as white hair in Immaterial and Missing Power, eye color changes, and lighter green on her dress. In every game after Perfect Cherry Blossom, Youmu wears short sleeves. As of Ten Desires, Youmu's appearance stays mostly the same, the only major change being her hair arranged in a messy style. According to ZUN, her height is "fairly short." During the events of Perfect Cherry Blossom, Youmu was ordered by Yuyuko Saigyouji to gather as much spring essence from Gensokyo as she could in order to get the entire cherry blossom garden, including the legendary Saigyou Ayakashi, to bloom perfectly. 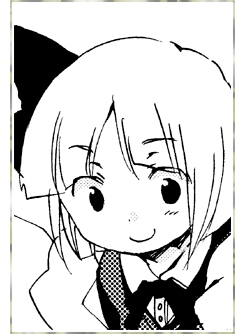 Youmu's efforts indirectly caused winter to continue unchecked in Gensokyo, prompting the player to find the source of the problem. Youmu tried to prevent the player from reaching Hakugyokurou, but was defeated. She also tried to stop the player's confrontation against Yuyuko, but was defeated again. 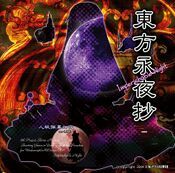 In Imperishable Night, she traveled to the world of the living with the intent to fix the moon--although Yuyuko was more interested in having a feasting tour with a "dragon dish" as the crowning attraction. 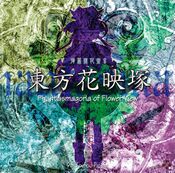 In Phantasmagoria of Flower View, she was minding her own business but kept encountering various people barging into Hakugyokurou suspecting her of being behind the flower incident. When she traveled to Gensokyo herself to behold the spectacle, she had a hunch about what was going on but only realized it fully when Aya Shameimaru pointed it out. Realizing that the incident was caused by an overabundance of spirits possessing the flowers, Youmu cut down some spirits to reduce their numbers a bit. This leads her into confrontation with Komachi Onozuka, who tells her she should not be cutting down spirits while in the world of the living because they haven't received judgement yet. Youmu protests that she's always allowed to kill phantoms while in the Netherworld, to which Komachi replies that phantoms in the Netherworld and phantoms above are two different things. Eiki Shiki, Yamaxanadu hears about Komachi's confrontation with Youmu and comes to meet Youmu herself. She explains about the phantoms inhabiting the flowers, and that the problem will go away by itself and Youmu should leave it alone. She then goes further about how Youmu's activities in the world of the living are coming dangerously close to getting Youmu classified as living and thus subject to judgement, and decides to carry out a little judgement on Youmu beforehand. In the end, Youmu arrives back at the Netherworld. Yuyuko was also asked by Eiki to teach Youmu more about the nature of spirits. Unfortunately, Yuyuko Saigyouji ends up misinterpreting that she's supposed to teach Youmu in a general sense, and ends up teaching Youmu how to pour delicious tea. Eiki in her storyline ends up having to elaborate and clarify her lecture to Youmu when Eiki confronts her again. Youmu's sword works on spirits by severing hesitation, which is the equivalent of helping someone reach Nirvana, and Youmu is not qualified to judge such a thing. In her winquote to Eiki, Youmu apologizes for the trouble she's caused, and thanks Eiki while saying she now understands the nature of her sword. 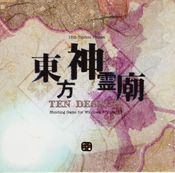 Youmu re-appears as a playable character in Ten Desires. She was baffled about the divine spirits, so she went out to investigate. 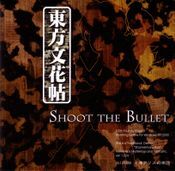 In Shoot the Bullet, Youmu is a target level 6, where she'll use spell cards when Aya Shameimaru take photos of her and her danmaku. 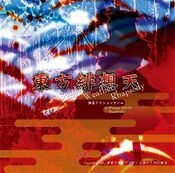 During the events of Scarlet Weather Rhapsody, she set off to investigate, concerned as to how and why someone was slaying spirits. 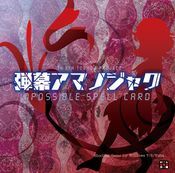 After a hint from Yukari Yakumo, she found and defeated Tenshi Hinanawi. 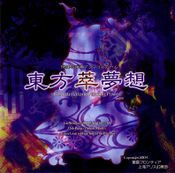 Youmu appears as a background cameo in Hopeless Masquerade on the Divine Spirit Mausoleum stage. She is seen with Yuyuko Saigyouji as she endlessly feeds her rice balls. Youmu travels out to Kourindou in search of the Soul Torch, an item given to her by Yuyuko that she had lost. Rinnosuke does in fact have it, and it turns out to be the reason for a large quantity of ghosts floating around the shop recently. Rinnosuke wasn't willing to part with it unless paid, however, so Youmu ended up shoveling the snow out of the front of the shop and off of the roof to pay for it. Youmu's mistress, ever since Youmu was born (stated by Youmu in Bohemian Archive in Japanese Red). Youmu is completely loyal to her, but has trouble understanding her. The friend of Youmu's mistress. Youmu respects her greatly and she helps Youmu with lessons and advice, but Youmu doesn't understand her, either. She also treats Yukari's servant, Ran Yakumo, with professional respect, even though Yuyuko says she doesn't have to. From Imperishable Night, Youmu is one of the few characters that is aware that three of the residents of Eientei are from the Moon, and presumably keeping it a secret like the others. 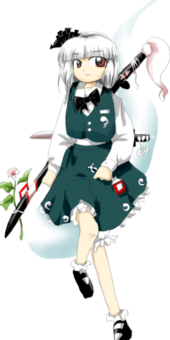 As a yama, Eiki is one of the superiors of Youmu's mistress, Yuyuko. Youmu is aware of the role of the yama and respects Eiki greatly, but hadn't met her in-person until Phantasmagoria of Flower View. In Youmu's ending, Eiki also asked Yuyuko to teach Youmu more about the nature of cutting down spirits. Eiki notes if Youmu loses to her in the story mode that Youmu would normally not go to Eiki for judging upon death. Youmu and Komachi first met in Phantasmagoria of Flower View. As a ferryman under the yama, Komachi could also be considered a fellow employee of sorts with Youmu, although their lines of work do not cross very often. Youmu is aware of Komachi's position and respects her a lot, often thanking her for her work on ferrying the dead whenever the two meet. Komachi also tries to teach Youmu about how Youmu should not cut down ghosts too often, and sees Youmu as "an interesting fellow" in Scarlet Weather Rhapsody. 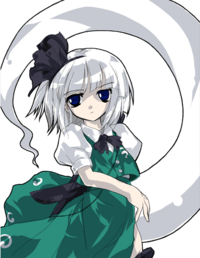 Youmu is acquainted with many other major characters (be it from their visits to the Netherworld or Youmu's own investigations), but generally not close to them personally. Being straight forward and earnest, Youmu tends to get picked on a lot. Youmu's Sigil in The Grimoire of Marisa. Youmu's different color palettes from Touhou Hisoutensoku. The 2nd one corresponds to her second color palette in SWR, while the 3rd one corresponds to her IaMP palette. 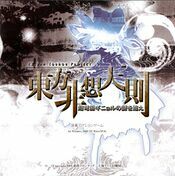 「六道怪奇」 Bizarreness of Six Realms IN Familiar:「半幽霊」"Phantom Half"
符の参「業風神閃斬」 Hell God Sword "Sudden Divine Severing of Karmic Wind"
In Touhou Hisoutensoku, one of Youmu's new Spell Cards resembles one of Grant's supers from Garou: Mark of the Wolves. 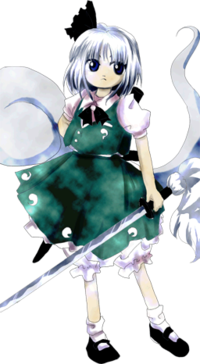 Also in Touhou Hisoutensoku, one of Youmu's palette swaps seems to resemble Nue Houjuu. Konpaku Youmu a Stage 5 boss, a being of half-human and half-phantom. She's both the second gardener for the Saigyouji clan and the guardian of their mistress. Mainly she posses the ability to handle sword techniques. Youmu looks after the garden with two swords: Roukan-ken is a longer sword that has the power of killing ten phantoms; Hakurou-ken is a shorter one that can slash down the confusion of humans. Youki Konpaku, the former gardener, had been the one for about 300 years, but suddenly became a hermit after having made a very young Youmu his successor. Youmu's ability of swordsmanship has still been in progress, so she needs daily practice. Though Youmu herself has no clue where her master is, she thinks of her master's absence as a lesson from him. This time, following the order the mistress of Saigyouji gave her, she has gathered all of spring essences in Gensokyo to make Saigyou Ayakashi bloom fully. Here in Hakugyokurou, there are so many cherry blossoms besides Saigyou Ayakashi, which has never bloomed. The former gardener said, "I've seen the fully-bloomed Saigyou Ayakashi before, but this might be the last time." At that time, Youmu had no idea what he meant and why the mistress of Saigyouji gave her such an order. Youmu sweeps the garden of the Saigyouji family; it's about 200 yojanas long (The mistress exaggerates, of course). This garden has a terrifyingly large amount of cherry trees, where they are attractions for residents all over the Netherworld. When spring comes, Youmu is very busy in sweeping. This year isn't the exception, too. The ghosts are really thrilled by the wonderful cherry trees. Everyone said, "I'm happy to be a ghost!" On the other hand, Youmu, the half-human saw this raving scene and half-sympathised by saying: "I'm half happy to be a half phantom!" Now, all she should do is wait for the blooming of Saigyou Ayakashi. A gardener who works in Hakugyokurou and lives there. She's half-human and half-phantom, half-dead and half-alive, half-phantom and half-reality, and altogether half-baked. Yet she has two swords. She applies all her effort to anything and everything, but it hardly ever pays off. Compared to the quirky cast of characters that inhabits Gensokyo, her all too straightforward personality makes her easy to tease. She's very good at fighting arts for someone so half-baked. She's also quite good at magic for such a half-baked character, and actually has a good sense of balance between the two. Using the Roukanken and Hakurouken, which were said to be forged by youkai, she can cut through enemies and ghosts and bullets and people's worries. The things she can't cut through are next to none. Roukanken (the longer one) has the power to kill ten ghosts in one slash. Hakurouken is said to be able to cut through people's confusion, but of course, both of them can also kill living humans. A being that is half a human and half a phantom. She's a half-human and half-phantom in the Netherworld. She possesses the ability to handle sword techniques. She attacks her enemy with Roukanken and Hakurouken. She is a useful girl whose body has two half kinds: human and phantom. She's supposed to be the swordsmanship teacher of Yuyuko-sama, still, she has to do the work of a gardener first every day. She's so immature you can't help liking her because of her straightforward and pure character, yet she's always made fun by anybody for her nature. The nature of residents in Gensokyo is beyond simplicity. Her weapon is serious manners, which may reaches a sense of desperation. This time, she makes her trip with Yuyuko. Focused movement is only available when she's alone. It's difficult to master her because of her narrow range of attack and the unique movement of her soul figure. When you use her Spell Card, you can't move. By the way, you can return the soul figure back to Youmu by changing to Yuyuko. Mastering her is absolutely important when using her. She's the gardener of Hakugyokurou, which is in the world past death, but actually she is a swordmanship teacher for Yuyuko. Even she herself is not certain whether she is alive or not, or whether she is considered a human. Even though she has longer life expectancy than human's, it seems that she can experience death, so maybe she is alive. Konpaku's swords were designed primarily for use against spiritual beings, but they still seem to work well against living beings. A gardener of Hakugyokurou in the Netherworld. She possesses the ability to handle sword techniques. Originally, she's a swordsmanship teacher of her mistress. Knowing that the flowers were in full bloom in Gensokyo, she came to see the scenery. Though she saw lots of ghosts hiding behind the flowers, she pretended not to see them. A gardener of Hakugyokurou in the Netherworld. Originally, she's the swordsmanship teacher of her mistress. Knowing that flowers are in full bloom in Gensokyo, she came to watch the scenery. Though she saw lots of ghosts hidden behind the flowers, she pretended not to see them. Personality: doesn't pay too much attention to her own style. Tries very hard, in many ways. She's straightforward and often speaks her mind, but never whines about anything. She is both the gardener of Hakugyokurou (which is in the world past death) and the swordmanship teacher for Yuyuko. She is always busy doing her chores as the gardener of the incredibly large Hakugyokurou garden. She's straightforward and always on her duty, but very easy to be deceived. Her life was quite peaceful as the phantoms wouldn't make much of a fuss these days. Then there was a sudden appearance of a mysterious spirits - the divine spirits were beings that was composed of the desires of humans. Their existence is very transient, so they disappear quickly. But she went off to investigate hoping that there will be no more incidents relating to any kind of spirits in the future. ↑ Yojana (योजन) is a unit of the distance that was used in ancient India. The exact length of the unit was not defined, but it's said that 1 yojana equals about 10-15 kilometers. In other words, if you taken Yuyuko's word as it is, then the Saigyouji's garden is supposed to be about 2,000-3,000 kilometers long. This page was last edited on 17 April 2019, at 06:42.